By the support of our talented team of personnel, we are involved in manufacturing, exporting, wholesaling, retailing, trading and supplying Mother Of Pearl Wall Tiles. Our product is praised in the market due to its best finishing & attractive designs. This product is crafted by utilizing utmost quality stone by our experienced craftsmen. Offered product is comes in different designs, sizes and other customized options so as to meet the demand of customers. 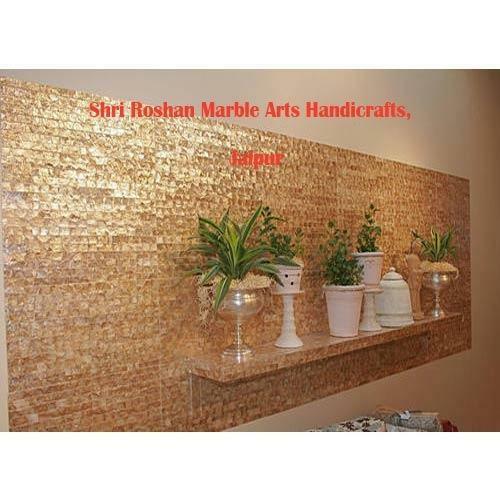 Known for the purpose of manufacturing, supplying, exporting, wholesaling, trading and retailing the best quality of Marble Products, Shri Roshan Marble Arts & Handicrafts was established in the year 2007. The product range offered by us consists of Marble Jali, Marble Panels and Marble Carvings. Known for their impeccable finish, alluring design, elegant appearance, these marble products are highly demanded in Bunglows, Hotels, Resorts, Temples and Residential Flats. Our customers can avail the offered marble products in various sizes and designs, as per their needs and requirements. Rendered by us at industry leading prices, these marble products are highly appreciated among our customers. With the aid of our large production capacity, we have been able to meet the bulk assignments of the offered marble products within the assured time frame. Quality of the offered marble products is never compromised at our end, by conducting different quality assurance procedures. USA, UAE, Europe and Singapore, are some of the countries where we export the offered products.